Research has shown consistently that social origin has exceptionally strong effects on educational outcomes in Germany. Alongside the primary effects of social origin, it is the secondary effects that are especially strong. The reasons for these differences in educational decisions, which persist even when academic abilities are held constant, are not clear. Several theoretical approaches claim to explain the association between social origin and educational decisions. These include rational choice theory and different versions of bounded rationality; theories based on the relevance of values, social norms, and reference groups; social capital theory; and cultural capital theory. However, simultaneously judging the relative merits of these approaches requires the appropriate data. Up to now, there has been a particular lack of consistent measures across all relevant educational stages over the life course. Longitudinal data offer great advantages for determining the causal effect of the factors under consideration. Previous data has been restricted to a single educational decision and has been either cross-sectional or restricted to locally defined samples. 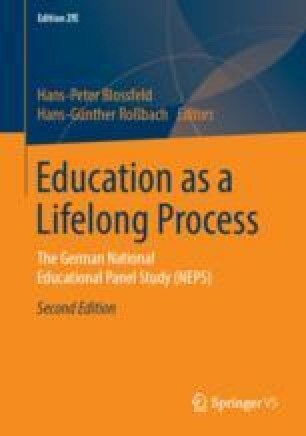 Pillar 3 of the German National Educational Panel Study (NEPS) aims to measure the relevant factors for explaining educational decisions and inequality in educational opportunity in all relevant stages over the life course. We regret the sudden and untimely death of Volker Stocké, who died on August 22, 2017.